Have you ever thought what your makeup brush sets were made out of? Go ahead, take a look at your makeup bag and select a brush, any brush. Did you know that it could have real animal fur or hair? Maybe you’re allergic to — or opposed to the use of — animal hair and looking for an alternative vegan makeup brush set. 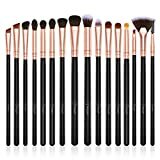 In today’s market, there are a lot of makeup brush sets to pick from. From expensive to cheap sets. 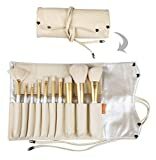 Not mention, there are so many brands to choose from that design great vegan makeup brush sets. It takes a matter of research to find the brush set that is right for you. They repel bacteria and dirt better than animal hair does. They shed less, if at all. They work with both cream and powder makeup products. brushes. 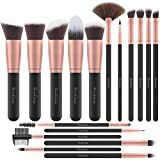 We decided to compile a list that will help take the guesswork out of choosing a vegan makeup brush set that is right for you. 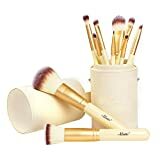 What is a Vegan Makeup Brush Set? 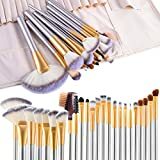 After watching makeup tutorials on YouTube, you will find each makeup-artist saying this one thing, “You need to use a good, high-quality brush.” The type of brush you use can make or break the way your makeup will look. By the time you’re done applying, it will either look streaky or perfect. Traditionally made with squirrel, mink, or horse hair, makeup companies are now looking for natural materials to use in their makeup brush sets. Vegan makeup brush sets are becoming highly recommended by makeup-artists. 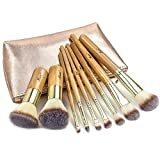 Vegan makeup brush sets are made of Taklon fibers or nylon fibers. This makes them hypoallergenic, especially if you have any animal allergies. Makeup companies such as Girls with Attitude, EcoTools and Wet n Wild have gone cruelty-free with their brush sets. 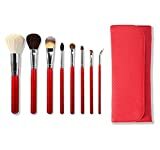 They are a cruelty-free company that produces beautiful vegan makeup brush sets. Celebrities and makeup-artists give GWA two thumbs up. Their Rainbow Collection is beautifully created, in a three-tone turquoise, purple and pink ombre with a metallic handle. The brushes are made with vegan; synthetic hairs loved by all using them. 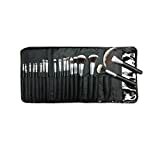 Who wouldn’t love this ten brush set? 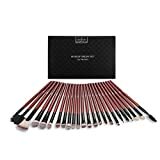 As a show of good faith, Wet n Wild made a favorable decision, moving to animal-free brushes. In 2016 they gave the world a sneak peak of their vegan makeup brush set. They lived up to the hype! 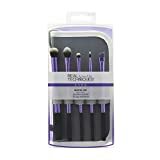 EcoTools make another great vegan makeup brush set. Their bamboo-handle, Taklon bristles, and other natural resources help you and Mother Earth look fabulous! Their affordable brushes, beloved by celebrities, are in many drugstores. Unlock your real beauty, and feel great about it, with these gorgeous vegan makeup brushes. Finding the right vegan makeup brush set can be a challenge, especially if you’re happy with your current set. But, with a little research, you can find one that fits your needs. Vegan makeup brushes are becoming the highlight of makeup-artists’ toolkits around the world. From sparkling brush handles to bamboo and natural, the sky’s the limit.